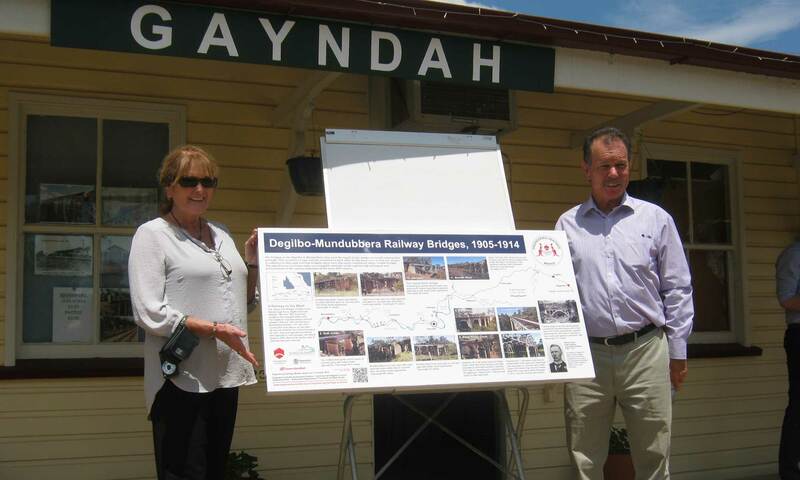 In October 2016 an “Iconic Railway Bridges Interpretive Panel” and an Australian Heritage Association Marker Plaque were presented to the North Burnett Regional Council by the President of the Australian Engineering Heritage Association. This depicts the Delgilbo to Mundubbera railway bridges constructed from 1905-1914. Queensland President of the Australian Engineering Heritage Association, Mr Alan Churchward said they represent the “Best example of a collection of historic railway bridges in Australia”. 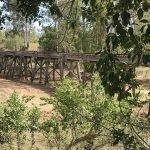 Mike Goebel and his fellow members of the Burnett River Rail Trail Group are to be congratulated for bringing this to fruition. It is a wonderful document. 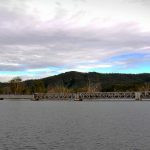 This post contains all the information from the Interpretative Panel , and is used with permission from Engineers Australia. Please respect their full copyright as the original publishers. The bridges on the Degilbo to Mundubbera line were the result of new design ideas and construction methods. The variation in type and the proximity to each other on the same railway line is unique. 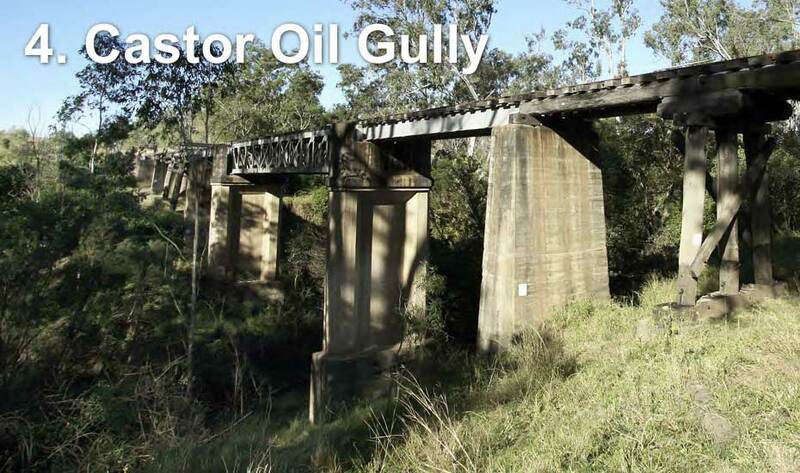 In addition to steel and concrete bridges, there were also many traditional timber trestle bridges. 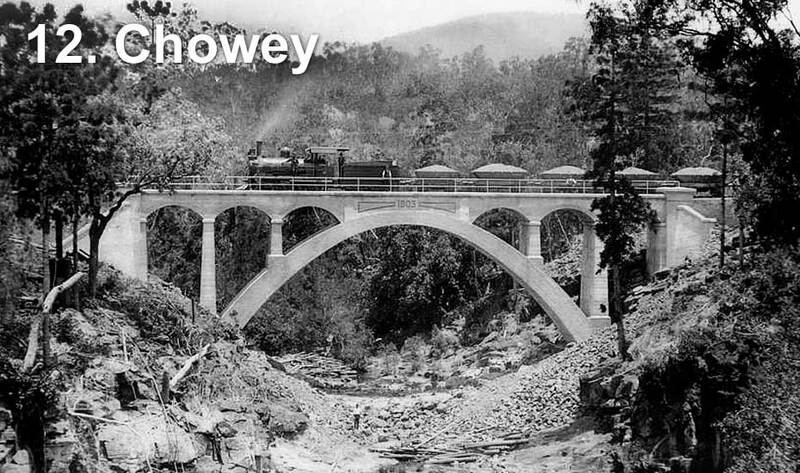 The significance continues today as a tangible reminder of the engineering techniques and achievements of the railway engineers of the early 20th century. 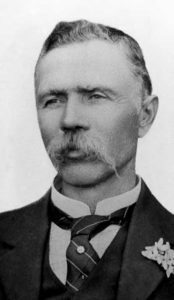 William Pagan,Chief Engineer Qld Railways (1902-1911). 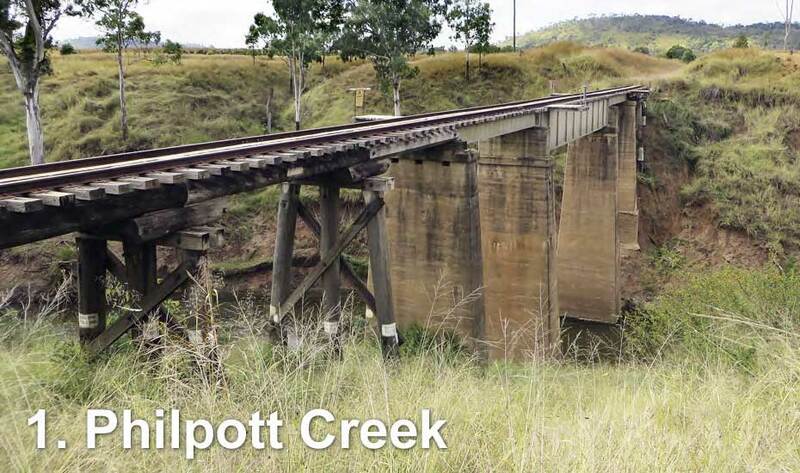 The bridges were built under the supervision of William Pagan, Chief Engineer Queensland Railways. 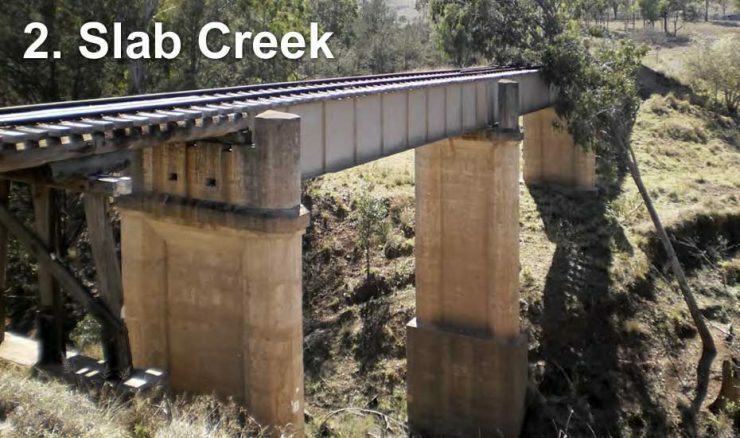 The variety of designs he used for these bridges show many innovations including the use of parts from previously-constructed bridges which resulted in better or less costly structures. 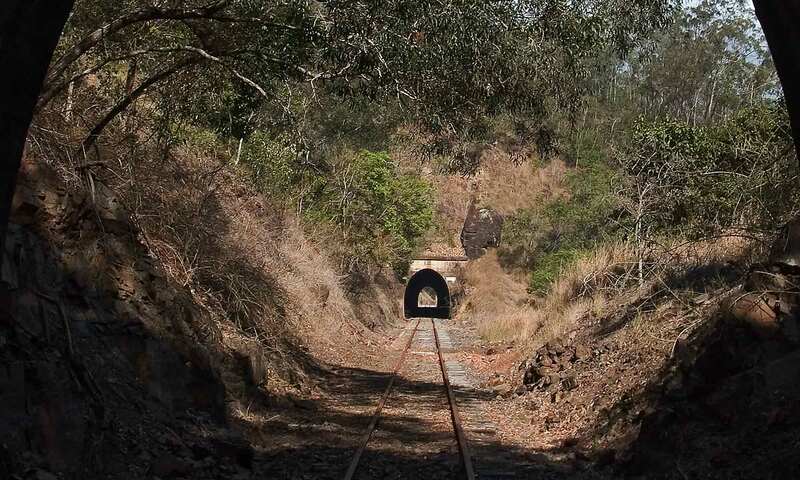 The railway from Mungar Junction on the Maryborough line to Degilbo was built between 1889 and 1893. Economic conditions then stopped further work. 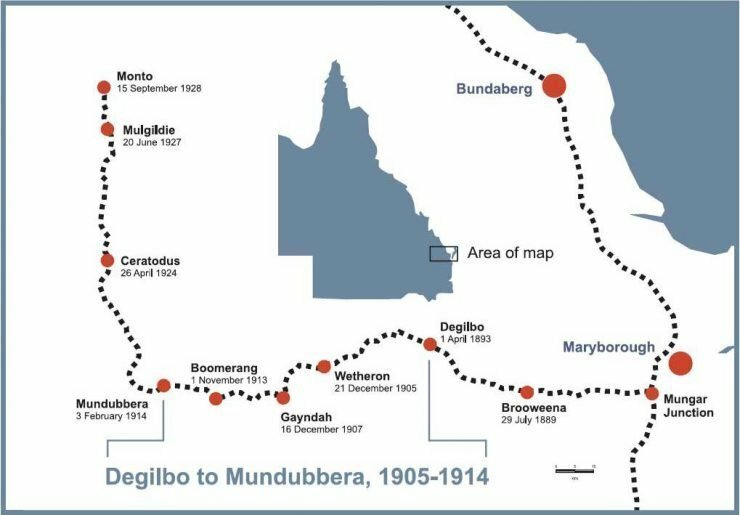 The Degilbo to Gayndah section was built between 1903 and 1907 and the line to Mundubbera between 1911 and 1914. 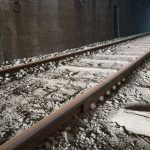 Construction took place in an era when rail was the dominant form of land transport for meat, dairy and agricultural products. Now replaced by road transport, the railway closed in 2004. 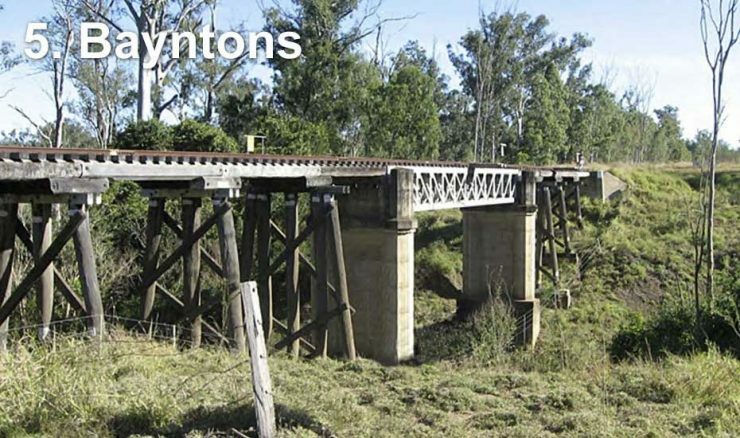 Most of the section west of Gayndah has been removed. Click the images to see a larger version in a lightbox. Hover over the individual images to pause the slideshow. There is a map at the bottom which will open in a new lightbox, showing the location of each bridge. Steel box girder central spans on concrete piers with timber trestle approaches. Total length 70 metres. 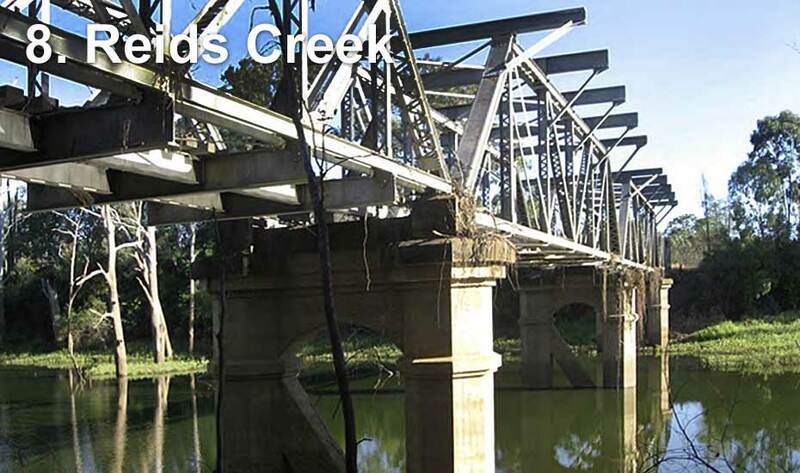 Lattice truss main span and rolled steel joist side spans on concrete piers with timber trestle approaches. Total length 76 metres. 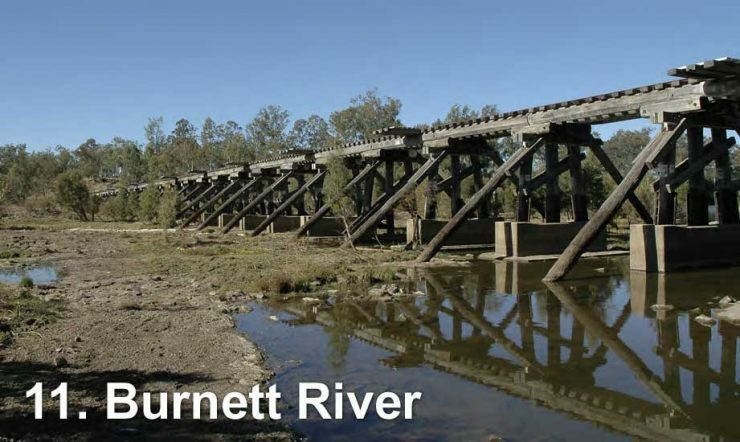 Rivetted lattice truss main span with rolled steel joist spans either side on concrete piers and timber trestle approaches. Total length 86 metres. 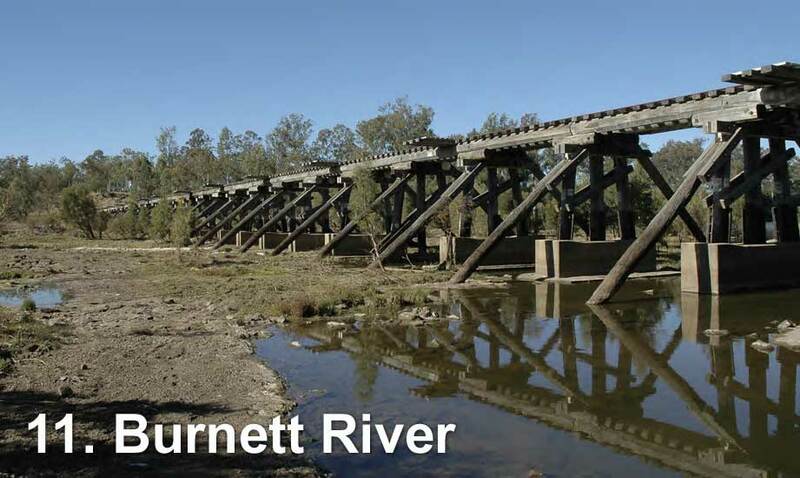 Rivetted lattice truss main span on concrete piers with timber trestle approaches. Total length 55 metres. Humphrey No 2 (48 metres long) is an early example of reinforced concrete in Australia. Each span is "discontinuous" (separate from its neighbours). 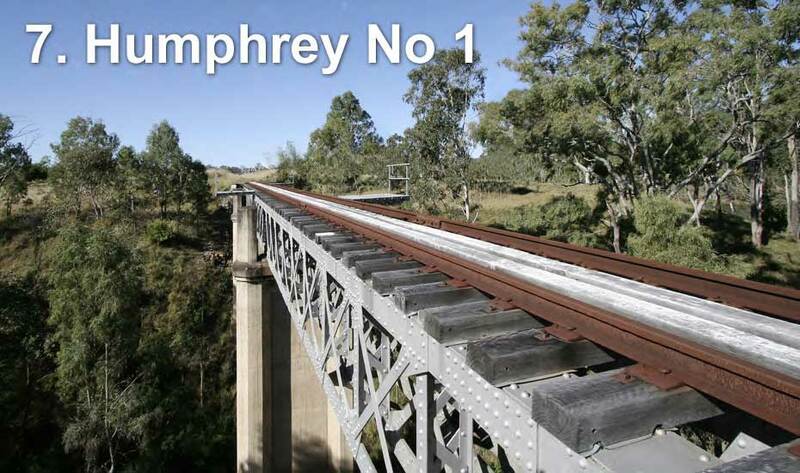 Humphrey No 1 (68 metres long) has two rivetted lattice truss spans and rolled steel joist side spans on concrete piers. 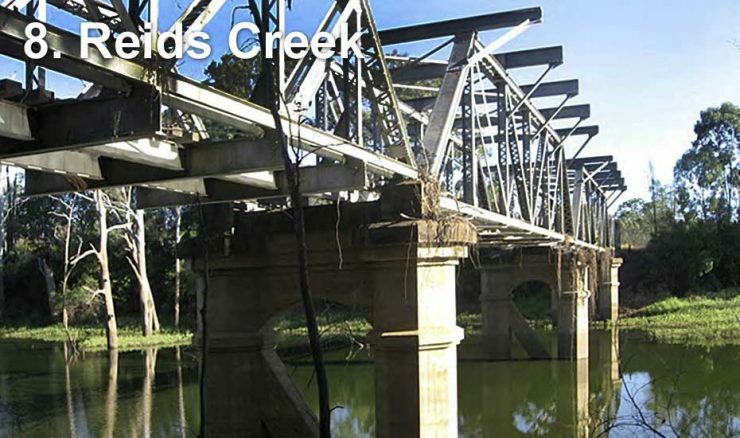 Reids Creek (106 metres long) had four rivetted steel Pratt Truss spans. Badly damaged in 2013, only the concrete piers remain. 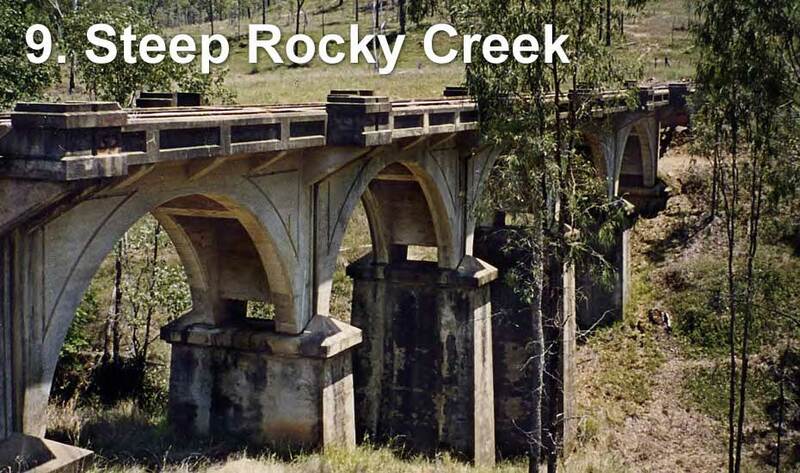 Steep Rocky Creek (58 metres long) is an early example of reinforced concrete in Australia. Each span is "discontinuous" (separate from its neighbours). It has side spans of rolled steel joists. 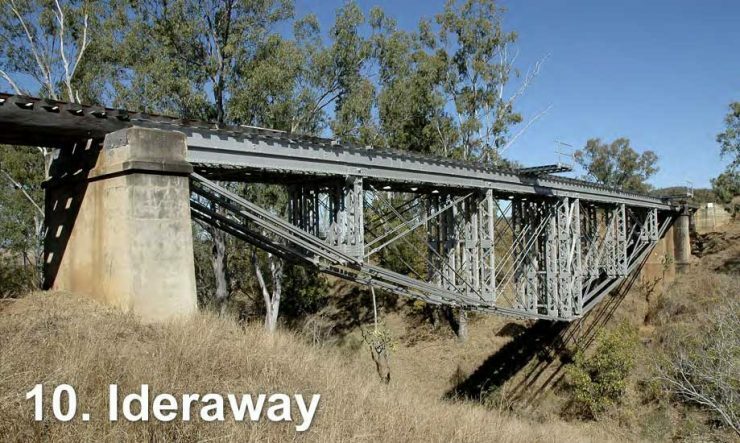 Underslung pin-jointed steel fish-belly truss spanning 45 metres supporting longitudinal steel beams with timber trestle approaches. Total length 69 metres. Nearly 1000 feet (294 metres) long and with 58 spans, this was the second longest timber trestle rail bridge in Queensland. It had significant bracing to help it withstand floods but it was extensively damaged in 2013. 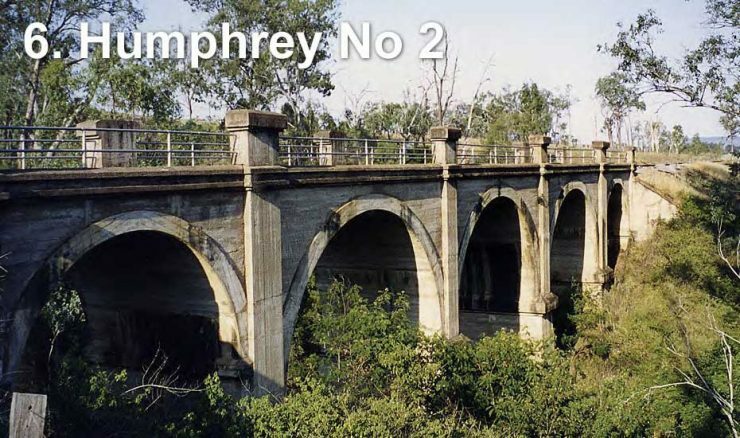 The first bridge to be built was this elegant unreinforced concrete structure with a main span of 24 metres supporting four spandrel arches and two side arches. It was built in nine months and opened in December 1905. The bridge is State Heritage listed. 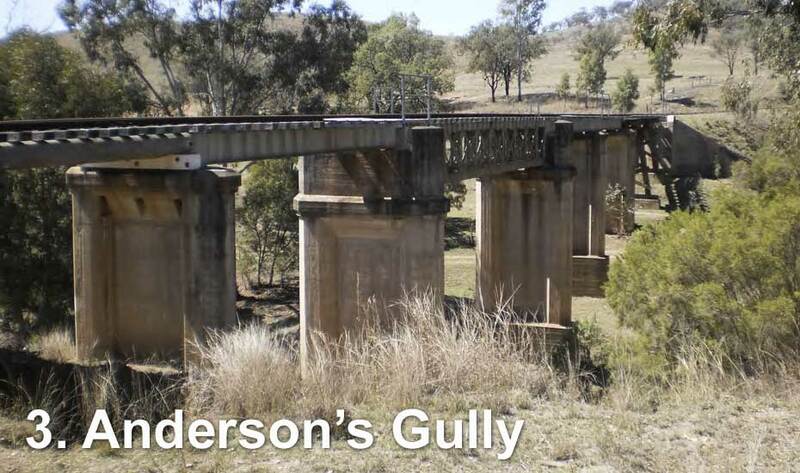 Previous PostPrevious Rail Trails in the news and on websites around the world.